It’s been a while since I last posted here, due mostly to the HUGE release of Paizo’s Pathfinder Roleplaying Game Core Rulebook and the Pathfinder RPG Bestiary. That’s about a thousand pages of gaming material, and the initial releases of the Core Rulebook sold out before we even got it in our warehouse, and the Bestiary (which hits stores next week) is looking like a success of similar proportions. This has resulted in “that’s a good problem to have, but a problem none the less” becoming my official slogan of the last three months. Selling out huge print runs is indeed a problem, and involves all sorts of priority (and money) juggling and a laser focus. In light of all of this, it’s a bit difficult to remember that Pathfinder is not Paizo’s only brand, and that we’ve got lots of great classic science fiction to publish as well. Sure, the craziness has delayed Planet Stories shipments a bit, but with the chaos largely behind us and the latest Planet Stories volume on its way to subscribers, it’s time to take another look at what’s been going on lately, and what’s coming down the pike. That new book I mentioned above is actually 85 years old this year, but it hasn’t been published for decades. I’m speaking of A. Merritt’s THE SHIP OF ISHTAR, surely one of the finest classics of fantasy ever published. Merritt was once counted among the finest fantasy writers in America, and while “in the know” readers recognize his talent and influence to this day, most of the modern audience has never heard of him. That modern audience, I’m sorry to say, also includes book buyers, and while THE SHIP OF ISHTAR is probably the best-written and is certainly the best illustrated (thanks to 10 plates by the legendary Virgil Finlay rescued from two previous editions and collected here for the first time) Planet Stories book to date, it also has some of the lowest pre-orders on record. I expect reader reaction to be very positive on this title, and hold out hope for a “slow success,” but these things are not exactly going to be falling off off the shelves of your local bookstore, so ordering direct from Paizo.com may be your best bet to pick up this truly remarkable book. Hey, the guys over at the Robert E. Howard blog The Cimmerian are really excited about THE SHIP OF ISHTAR, and they really know their stuff. Editor Deuce Richardson just called it “the best edition of this landmark fantasy novel in 60 years,” and I couldn’t agree more (admittedly, with a bit of bias). Leigh hadn’t been in the writing game quite a full decade when she penned The Sword of Rhiannon and was yet to come into her full powers as an author. That said, Brackett had obviously found her own voice at that point, assimilating her influences and carving out her queendom in the science-fantasy field. The Sword of Rhiannon moves at a relentless pace and is filled to the brim with plot-twists and reversals of fortune. Carse is a “damaged hero” in the classic Brackett mold who hews and schemes his way across a gorgeously-imagined world. The Sword of Rhiannon was a milestone in Leigh Brackett’s career and is a novel well worth reading today. I couldn’t agree more! Of course, if Leigh Brackett is your flavor of choice, Planet Stories has plenty of excellent adventure in store for you in the other four Brackett novels we’ve published to date. There’s the famous SKAITH TRILOGY (THE GINGER STAR, THE HOUNDS OF SKAITH, and THE REAVERS OF SKAITH), of course, all of which feature her influential and thoroughly awesome swordsman Eric John Stark of Mercury, one of science fantasy’s original outlaws. Prominent gamer Joe Kushner recently picked up the first Eric John Stark Planet Stories book, THE SECRET OF SINHARAT, which features two revised Stark novellas that originally appeared in the magazine Planet Stories in the 1940s. Kushner takes an interesting reviewing approach, riffing off of ideas found in the book and extrapolating how they might be used in an RPG campaign. I found this perspective quite interesting, and suspect you will too. More has happened in the last month or so, but this post is already getting a little long in the tooth. I’ll be sure to come back soon! Until then, don’t be a stranger. Please post a comment here on the blog. It’s nice to know someone is out there actually reading this stuff! Erik’s Note: I recently composed this for my personal blog, Paperback Flash, but I figured it would also be interesting to readers of the official Planet Stories blog, since it’s about one of the most important books of one of our most important writers, C. L. Moore. Enjoy! Catherine Lucille Moore (1911 – 1987) was one of the finest fantasy and science fiction writers of the Pulp Era, contributing two characters of historical significance in the form of Jirel of Joiry, the first female sword & sorcery protagonist and Northwest Smith, a spacefaring scoundrel who very likely served as a template for Han Solo and Indiana Jones. Later, her collaborations with husband Henry Kuttner (often published under the byline Lewis Padgett) would go on to become bedrock classics of the genre. Moore is a member of the Science Fiction Hall of Fame, and her status as one of the grand masters of the pulps is a given. I particularly enjoy her writing, which my friend Kenneth Hite once described as “Clark Ashton Smith on Cialis.” When I first encountered her lushly described, vivid prose, I immediately thought of H. P. Lovecraft and Clark Ashton Smith, though my reading in the last few years has traced this influence even farther back to Abraham Merritt, the giant of the early 20th century whose The Moon Pool and The Ship of Ishtar (among others) cast looming shadows over the Pulp Era. Moore’s use of language and many of her themes are perhaps best described as “Merrittesque,” though her stories often involve a sensual, in some cases barely disguised sexual element that makes them stand out from many of their staid contemporaries in the Pulp Era. Though her influences are clear, C. L. Moore is very much her own writer, and a great one at that. The best dress designer on Cyrille seemed to be a soft-voiced, willowy woman with the pink skin and narrow, bright eyes of a race that occupied three planets circling a sun far across the outskirts of the Galaxy. She exuded impersonal deftness. One felt that she saw no faces here, was aware of no personalities. She came into the room with a smooth, silent aloofness, her eyes lowered. But she was not servile. In her own way the woman was a great artist, and commanded her due of respect. The composition of the new gown took place before the mirrored alcove that opened from the bedroom. Helia, her jaw set like a rock, stripped off the smart military uniform which her mistress was wearing, the spurred boots, the weapons, the shining helmet. From beneath it a shower of dark-gold hair descended. Juille stood impassive under the measuring eyes of the newcomer, her hair clouding upon her shoulders. Now she was no longer the sexless princeling of Lyonese. The steely delicacy was about her still, and the arrogance. But the long, fine limbs and the disciplined curves of her body had a look of waxen lifelessness as she stood waiting between the new personality and the old. She was aware of a certain embarrassed resentment, suddenly, at the step she was about to take. It was humiliating to admit by that very step that the despised femininity she had repudiated all her life should be important enough to capture now. The quality of impassivity seemed to puzzle the artist, who stood looking at her thoughtfully. “Is there any definite effect to be achieved?” she asked after a moment, speaking in the faintly awkward third person through which all employees upon Cyrille address all patrons. The dresser mentally shot a keen glance upward. She was far too well-trained actually to look a patron in the face; but she had seen the uniform this one had discarded, she saw the hard, smooth symmetry of the body and from it understood enough of the unknown’s background to guess what she wanted and would not request. She would not have worked her way up a long and difficult career from and outlying planet to the position of head designer on Cyrille if she had lacked extremely sensitive perception. She narrowed her already narrow eyes and pursed speculative lips. This patron would need careful handling to persuade her to accept what she really wanted. “A thought came to me yesterday,” she murmured in her soft, drawling voice—she cultivated the slurred accent of her native land—”while I watched the dancers on Dullai Lake. A dark gown, full of shadows and stars. I need a perfect body to compose it on, for even the elastic paint of undergarments might spoil my effect.” This was not strictly true, but it served the purpose. Juille could accept the gown now not as romance personified, but as a tribute to her own fine body. “With permission, I shall compose that gown,” the soft voice drawled, and Juille nodded coldly. The dresser laid both hands on a section of wall near the alcove and slid back a long panel to disclose her working apparatus. Juille stared in frank enchantment and even Helia’s feminine instincts, smothered behind a military lifetime, made her eyes gleam as she looked. The dresser’s equipment had evidently been moved into place behind the sliding panel just before her entrance, for the tall rack at one end of the opening still presented what must have been the color-selection of the last patron. Through a series of level slits the ends of almost countless fabrics in every conceivable shade of pink showed untidily. Shelves and drawers spilled more untidiness. Obviously, this artist was great enough to indulge her whims even at the expense of neatness. She pressed a button now and the pink rainbow slid sidewise and vanished. Into its place snapped a panel exuding ends of blackness in level parallels—satin that gleamed like dark water, the black smoke of gauzes, velvet so soft it looked charred, like black ash. The dresser moved so swiftly and deftly that her work looked like child’s play, or magic. She chose an end of dull silk and reeled out yard after billowing yard through the slot, slashed it off recklessly with a razor-sharp blade, and like a sculptor modeling in clay, molded the soft, thick stuff directly upon Juille’s body, fitting it with quick, nervous snips of her scissors and sealing the edges into one another. In less than a minute Juille was sheathed from shoulder to ankle in a gown that fitted perfectly and elastically to her skin, outlining every curve of her body and falling in soft, rich folds about her feet. The dresser kicked away the fragments of discarded silk and was pulling out now such clouds and billows of pure shadow as seemed to engulf her in fog. Juille almost gasped as the cloud descended upon herself. It was something too sheer for cloth, certainly not a woven fabric. The dresser’s deft hand touched lightly here and there, sealing the folds of cloud in place. In a moment or two she stepped back and gestured toward the mirror. Juille turned. This tall unknown was certainly not herself. The hard, impersonal, perfect body had suddenly taken on soft, velvet curves beneath the thick soft fabric. All about her, floating out when she moved, the shadowy billows of dimness smoked away in drapery so adroitly composed that it seemed an arrogance in itself. “And now, one thing more,” smiled the dresser, pulling out an untidy drawer. “This—” She brought out a double handful of sequins like flashing silver dust and strewed them lavishly in the folds of floating gauze. “Turn,” she said, and Juille was enchanted to see the tiny star points cling magnetically to the cloth except for a thin, fine film of them that floated out behind her and twinkled away to nothing in midair whenever she moved. Juille turned back to the mirror. For a moment more this was a stranger whose face looked back at her out of shining violet eyes, a face with the strength and delicacy of something finely made of steel. It was arrogant, intolerant, handsome as before, but the arrogance seemed to spring now from the knowledge of beauty. And then she knew herself in the mirror. Only the gown was strange, and her familiar features looked incongruous above it. For the first time in her life Juille felt supremely unsure of herself. Not even the knowledge that the very stars in the Galaxy were subject to her whim could help that feeling now. She drew a long breath and faced herself in the mirror resolutely. So far, Planet Stories has reprinted collections of C. L. Moore’s two most popular characters, Jirel of Joiry in Black God’s Kiss and Northwest Smith in Northwest of Earth: The Complete Northwest Smith. Reviews for both collections have been very positive, somewhat surprising for fiction that is closing in on being eight decades old. A lot of the reviews highlight a specific weakness of her Jirel and Smith stories, a stylistic nuance that becomes much more pronounced when all of a given character’s adventures are collected in the same volume. The problem is this: Although Moore’s worlds are vividly realized, and her use of language and beauty of structure easily set these tales apart as classics, her classic characters don’t really do much of anything in the stories themselves. Rather, they watch as something very interesting happens to other people. They often emerge victorious against their enemies by tapping some inner strength or reserve, or taking some internal journey. Though Jirel comes armed with a sword and Northwest Smith packs his trusty heat gun, the weapons usually remain holstered and the stories are more psychological horror that action adventure. Not so here, in Judgment Night which almost seems to have been written in reaction to that specific criticism. Far from a wallflower, Juille spends the last several chapters of the book literally blowing apart an entire planet with an unthinkably powerful super-gun. It’s a thrilling cat-and-mouse scene filled with carnage, collapsing buildings, and all sorts of entertaining mayhem. Originally written as a two-part serial in 1943’s Astounding (edited by that titan of early SF, John W. Campbell, Jr.), Judgment Night came 10 years after Moore’s Weird Tales debut, when most of the Jirel and NWS stories were already behind her. It’s a transitional piece, of sorts, bridging the early era populated largely by her Jirel and Smith stories and her later material (much of it also published by Campbell) written in collaboration with her future husband, Henry Kuttner (the two were married in 1940, but this story shows very little if any Kuttner influence and has never been credited to him). The legendary Gnome Press published a hardcover edition of Judgment Night in 1952, complete with an effective cover from Frank Kelly Freas. That edition also included the short stories “Paradise Street,” “Promised Land,” “The Code,” and “Heir Apparent,” a good selection of Moore’s non-series character, non-Kuttner material. The 1965 Paperback Library version I read (pictured above) lacks these stories, focusing only on the title tale. 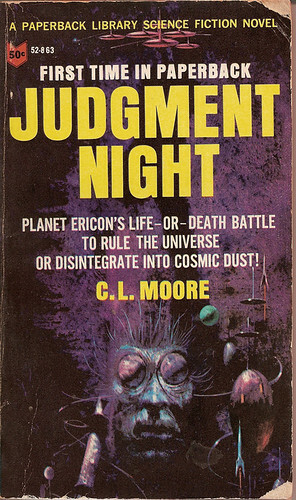 Although I like the Gnome Press edition and the other tales included therein are worthy additions to Moore’s canon, Judgment Night easily stands on its own as a great classic of Pulp Era science fiction. Noted RPG author and fantasy critic Kenneth Hite has just posted a review of the Planet Stories edition of C. L. Moore’s Northwest of Earth at Flames Rising. In the review, Hite takes on the common remark that Moore’s hero Northwest Smith set the mold for Han Solo, and makes a number of interesting observations about the stories in our collection. No, Smith may inhabit a solar system of Martian canals and Venusian swamps, but his adventures are less SF than a kind of lush, operatically colored noir. (Dario Argento instead of Sternberg?) As in noir, Smith can depend on nothing but his instincts to guide him: “a bed-rock of savage strength” is his real gift, an unbreakable will to survive as an individual that saves him time and again. He’s more Man With No Name than he is Han Solo. The world is strange, the city unfriendly (Smith spends a lot of time in various wretched hives of scum and villainy on Mars and Venus), and the girl … well, the girl is always the heart of the problem. In the course of his review, Hite manages to coin my favorite phrase to date in a Planet Stories review: “This opalescent fog of language is the best thing about the stories; Moore reads like Clark Ashton Smith on Cialis.” That sounds very appealing, and makes me wish we were going to reprint immediately so I could put it on the back cover. If you enjoy Ken’s review, I strongly urge you to pick up a copy of his latest critical work, Tour de Lovecraft: The Tales, which includes a short critical essay on every single story Lovecraft published under his own byline. It’s an amusing, insightful work sure to be of great interest to all Planet Stories readers. The Reavers of Skaith, by Leigh Brackett, is the final novel in the saga of Eric John Stark, Brackett’s most beloved SF character. It’s the fourth of the five Brackett books Planet Stories has published to date, with a stunning cover by James Ryman and an introduction by film director George Lucas, who discusses Brackett’s role in writing the first draft of The Empire Strikes Back and her influence upon the entire Star Wars saga. We were blown away that Lucas was able and willing to write such a thoughtful introduction for us, and this book looked like it had everything going for it and would become one of our strongest sellers. But everything does not always go over as planned. For unknown reasons (and this happens more often than most publishers would admit), Barnes & Noble simply decided to skip this book entirely, so despite all it has going for it the book has not had the robust distribution of many of our other titles. While that probably will mean fewer returns and a more steady journey to profitability in the long run (the same thing happened to Henry Kuttner’s Elak of Atlantis), it has the unintended effect of limiting the online discussion of the book to a relative whimper. Stark remains a ruthless killer and the ultimate survivor, with a combination of trained fighting prowess and animal instincts keeping him alive. Brackett once again spins a compelling story that gets the blood pumping and grabs the reader and won’t let them go until the conclusion of the story. If you haven’t yet seen a copy of The Reavers of Skaith at your local store, don’t despair! You can order directly from the publisher at Paizo.com. Christofer Marley has been treacherously slain. It appears that he died in some sordid brawl, but the murder is in fact the hidden act of one faction of the divided Prometheans, secret conspirators who serve Queen Elizabeth I. Marley’s death leaves no writer to pen the magically potent plays that keep the queen on England’s throne. But his co-conspirators hope to use another playwright: a promising young talent named Will Shakespeare. Unbeknownst to mortals, Marley’s life was saved by a queen of Faerie. He seeks his killers and aids Shakespeare in spywork and play-magic. But when Shakespeare is drawn into Faerie, the playwrights’ relationship changes. And a higher power than even Faerie takes a dark interest in the pair. Ink and Steel is the new novel in Elizabeth Bear’s fantasy series, “The Promethean Age.” Ink and Steel is also the first volume of “The Stratford Man,” a duology whose second and concluding volume is Heaven and Earth. With its beautiful prose, superior characterizations, intricate conspiracy, and deep historical, literary, and folkloric research, Ink and Steel demonstrates why Bear has received the Hugo, Campbell, Locus, and Sturgeon Awards. However, the novel also has a pair of significant weaknesses. The first is that, when William Shakespeare’s feelings for his friend and colleague Christofer Marley (a.k.a. Christopher Marlowe) shift from platonic to romantic, readers are given no glimpse of Shakespeare’s thoughts during his bisexual awakening. This absence makes the change difficult to believe, given that Ink and Steel initially presents Shakespeare as a heterosexual repulsed by homosexuality. The novel’s second weakness is its restless focus. The main plotline follows Shakespeare’s development, with Marley’s help, as a magician-playwright/conspirator/spy. But this plotline essentially vanishes as Bear explores Shakespeare and Marley’s altered relationship in depth. Then, both relationship and conspiracy take a back seat as Faerie’s tithe to Hell is paid, and Bear shifts her focus to the nature of damnation. By the end, Ink and Steel feels like three books under one cover. This problem may result from Ink and Steel being half a novel. Rumor has it the book is the first part of a single novel published in two volumes, the second of which is Hell and Earth: The Stratford Man, Volume II. Certainly, when you read Ink and Steel and Hell and Earth back-to-back in that order, the restless focus resolves into a logical structure. Reading the two volumes as one never quite makes Shakespeare’s conversion to bisexuality convincing. But, if you put that aside and take the books as a single novel‑-as a whole‑-they work wonderfully. Cynthia Ward (http://www.cynthiaward.com) has sold stories to Sword & Sorceress 24 (Norilana Books, http://norilana.com/), Asimov’s SF Magazine (http://www.asimovs.com/), and other magazines and anthologies. Her reviews appear regularly in Kobold Quarterly (http://www.koboldquarterly.com/) and Sci Fi Wire (http://scifiwire.com/index.php), and irregularly elsewhere. She publishes the monthly Market Maven e’newsletter (http://www.cynthiaward.com/maven.html), which covers market news in the science fiction, fantasy, and horror fields. She is working on her first novel, a futuristic mystery tentatively titled The Stone Rain. With Nisi Shawl, Cynthia coauthored the writing manual Writing the Other: A Practical Approach (Aqueduct Press, http://www.aqueductpress.com/conversation-pieces.html#Vol8), which is based on their fiction diversity writing workshop, Writing the Other: Bridging Cultural Differences for Successful Fiction (http://www.writingtheother.com/). Books like The Dark World remind me why I love fantasy/sci-fi so much in the first place. Here I’ve spent the better part of two decades reading every great author I can get my hands on, and not only are there new ones coming out constantly, there are still gems from years ago I have yet to read. Major chain bookstores took a pretty paltry order for The Dark World, I’m sorry to say, so if you haven’t had a chance to pick up this recent release yet, I suggest ordering directly from the source at Paizo.com. Thanks for the review, Jared! And thanks to all of you who have given Henry Kuttner a shot, either in our earlier releases such as Elak of Atlantis or in our brand new release, Robots Have No Tails.